The Aprilia RST Futura is equipped with an exhaust system that was innovative at the time and had an eye to environmental responsibility. Inasmuch as a gas guzzling 150 mph motorcycle can be environmentally responsible! 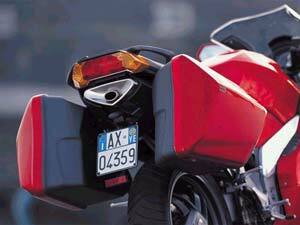 Under seat silencers were quite a rare thing back in 2000 when the bike was first unveiled, and the design allowed for large panniers to be fitted without reducing ground clearance. The exhaust routing was enabled by the single sided swing arm, though Aprilia’s engineers admitted getting it right was the hardest problem to solve during the bike’s development. The Futura was also fitted with a catalytic converter, and was very quiet – intolerably so for many owners. The standard system does tend to strangle the bike somewhat, and big gains can be had by replacing the system with something a bit more free flowing. For many owners this is what most owners want to change. A standard Futura at full charge is often compared with an angry sewing machine and at best not very Vee twin-like. On a standard exhaust a Futura sounds refined and sophisticated, but a change here and there can turn it into a snarling beast. Replace the whole lot and you can have an ear-splitting howl that’ll make you the toast of all your neighbours. Or maybe not. This is probably why many owners modify or replace the exhaust – in the US it seems almost obligatory. 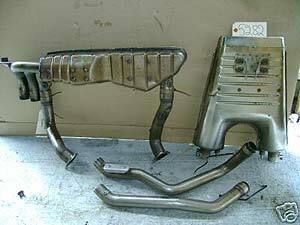 A pair of downpipes leaves the front and rear cylinder and enters the pre-silencer under the engine, where the gases mingle, then pass through the catalytic converter before exiting via twin pipes into the underseat silencer where they are mixed again and exit via a single exhaust. So that’s 2 into 1 into 2 into 1! Simple!